Do you read consumer reviews before buying a product or service? Do you spend lot of time browsing many sites for reviews, and then try to find helpful reviews that are applicable for you? If you answered "Yes", then BoolPool is for you. At BoolPool our mission is to quickly get you to reviews that are most useful for you. We achieve this in two simple steps. Step 1: BoolPool gets consumer reviews for your search from across the web. Step 2: BoolPool clusters all reviews, grouping similar reviews together in a cluster. How do you use these review groups (or clusters, as we call them)? If you want to read reviews that cover different aspects of the product or service, then you can read few reviews from each cluster. On the other hand, if you want to read reviews about a particular aspect of the product or service, you can pick the related cluster and focus on reviews in that cluster. Besides providing you an aggregated and clustered view, BoolPool provides many attributes like review ratings, date of the review, review source to filter and sort your review reading list. 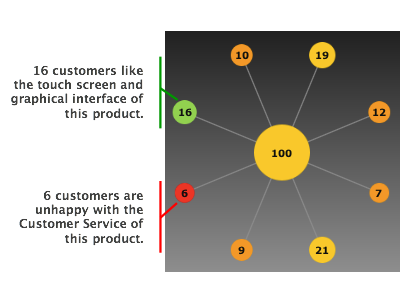 At BoolPool we use pictorial graphs that make it easy for you to identify strong and weak points for your products and services. Basically, reviews and ratings are translated into a pictorial graph that clearly highlights what other consumers want to tell you. For example, the picture on the left of this page is a pictorial graph of review clusters for one of the new tablet products. It shows 6 consumers were really unhappy with the customer service for this product. On the other hand there are 16 customers who really like the touch screen and graphical interface of this product. Sounds cool, Right? Note: BoolPool displays only snippet of each review. You can read full review by clicking on the review. This will open a new browser window and take you to the review source site where you can read the complete review.